It’s easily arguable that Foodists is the antithesis of quantity over quality. I don’t think any one of us would give up a brilliant food experience for sheer volume, but my recent phone conversation with BBQ Guru Ted Reader was all about big. You see, the day before he’d set out to break the Guinness world record for largest burger. And though not totally official yet, it seems like he did it. Using a custom-fabricated grill complete with forklift by sponsor Napoleon, 400lbs of hardwood charcoal, a customized oven for the bun, he grilled up a 307lb beef patty. 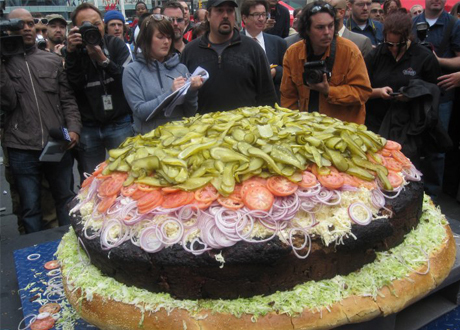 Slapped (well, probably more like lowered) onto a 104lb bun and a lot of condiments and garnish what he ended up with was a 590lb whopper of a burger. And Ted knows a few things about burgers. You see, this Toronto-based stunt was also a kick off to launch his latest book, Napoleon’s Everyday Gourmet Burgers. Ted’s got it made it seems, aligned with Napoleon, he’s got over 70 grills and barbecues in his backyard. He must also have an accepting wife because I could never get away with that! Then again, if I could feed her barbecue all year around and make a decent enough living at it to pay the mortgage maybe she would! Clearly Ted’s not just passionate about grilling and barbecue, but prolific. There are over 100 burger recipes in this new book. Now, you have to take the word “burger” a bit loosely here as almost anything between two slices of bread since there are some truly inventive creations in the book divided thoughtfully by meat type, plus some other occasions such as breakfast (yes, breakfast! ), dessert and stuff to drink during and after the hard work is done. I’d have loved to see an index, and the photography could have been a a bit more uniformly delicious looking, but the clearly laid out table of contents is straightfoward enough to find what you are looking for. Ted’s philosophy, he says, is “for people to be inspired, and to show them that you can do so many things with these recipes, and modify them any way you want…even use different meat or other ingredients.”. His message is simple: There’s art and beauty in the basic burger, but have fun and go beyond it. He’s right, and now there’s no excuse to get stuck in a burger rut. I asked him what his all-time favourite burger out of the book is. It is the kind of question that I half expected a canned response from. Yet, he had to give it some thought. After a brief pause he came up with the Fois Gras and Pulled Pork Burger with Green Apple Slaw. Now that’s the kind of burger that’ll make your heart flutter for more than a couple reasons, and like I said, not every recipe is what you’d really consider a burger. I got Ted to list off some other faves like: The Waffle Breakfast Burger; The In-N-Out Burger; The Schwarzenegger; The Super Thick and Cheesy; Red Neck Chicken Burger with Bacon and Cheddar Flapjacks; Turducken Burger with Honey Dew Orange Glazing Syrup; and the Blueberry Venison Burger. His top non-beef burger, he says, is the Halibut and King Crab with Pancetta. You see, these are the kinds of burgers that could easily elevate your backyard barbecue into a swanky affair your guests will talk about for a long time, especially if you serve them some Grilled Scallop Ritz sliders. Use the best meat you can find. The ultimate basic burger he cooks for his family just has salt, pepper and garlic. Burgers need rest, but it’s the opposite of what you do with a steak. After forming your patties, you need to let the meat rest again before grilling. One hour back in the fridge should do it. When mixing your meat, the colder the better so the flavours stay in the meat. If you overmix or the temp is too high, the fats start to melt and end up on your hands or outside the meat. You’ll know it’s cold enough when your fingers are slightly sore when mixing. Hey, it’ll keep you from doing too much of it anyway! For chicken burgers, take a whole breast or thigh and chop it up finely and mix in with your ground chicken. The texture will be unbeatable. Cook with the lid open (depending on the type of grill you are using) to see and control flare ups. In regards the previous point, read the manual and get to know the mechanics of your grill. Don’t be afraid to cook it longer at a lower temperature, but don’t poke, cut, press or touch it other than to flip it. Wood-planked burgers are a good because they don’t require flipping. Every time you want to touch it, have a beer instead. If you have a kid’s birthday party coming up and you’re looking to outdo everyone including your own past efforts, make Ted’s incredible looking Cupcake Burger. So what’s next for Ted. Get this: Beerlicious. Yup, nothing goes as hand-in-hand with grilling than beer so Ted’s brewing up 100 recipes with 100 different beers. I did say he had an incredible job didn’t I? Catch Ted in Vancouver tomorrow, Saturday, May 15th at 1:30pm at Barbara Jo’s Books for Cooks. There’s also the off chance you might spot him at the Alibi Room too. I sent him there to for research purposes. Beauty is exactly how you come to experience inside, but it will not harm to look really good on the outside.